Cloud 109: Nominate a Commando! 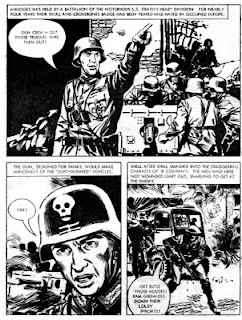 Over at Commando HQ, editor Calum Laird and his team are canvassing nominations for Commando comics which readers would like to see reprinted. 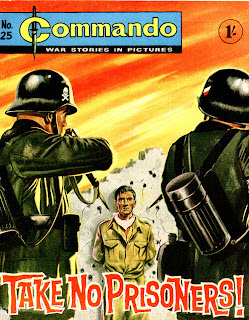 I'm pleased to see that one of my all time favorite stories Man-Trap (Commando No. 184) is already on the list of worthy contenders, and if you have suggestions I would urge you to visit the Commando website and post your suggestions. 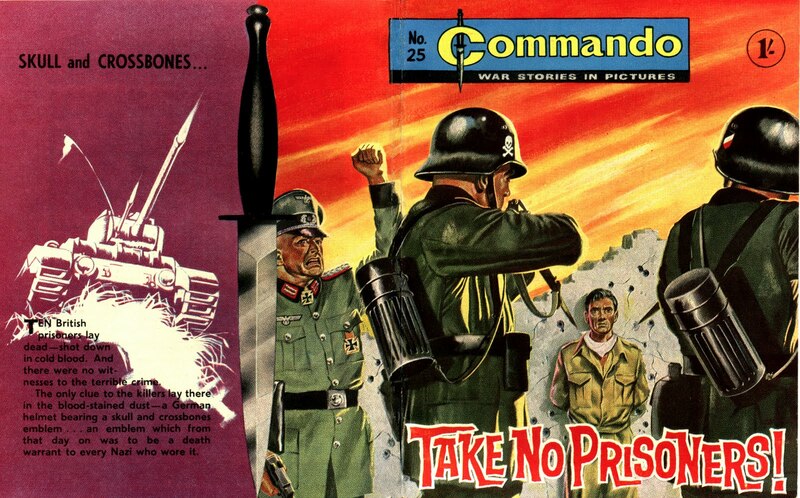 Here's another of mine, one of the earliest Commandos and one whose cover was so shocking for it's time that it absolutely commanded your attention. In addition to the powerful Ken Barr cover, the script by retired Major Eric Hebden and artwork by Jose Bielsa made for one of the most memorable comics of this title's first year. It's worth mentioning that although DC Thomson would always supply photographic reference to their artists, the selection of appropriate photos in 1961 just wasn't that great. 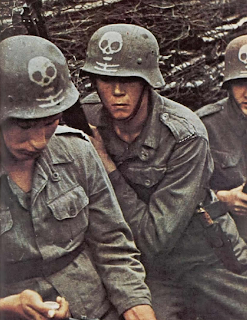 Hebden's script demanded a certain amount of licence as he described a death's head insignia on the SS men's helmets, but in reality this would have been a collar flash and not helmet decal. 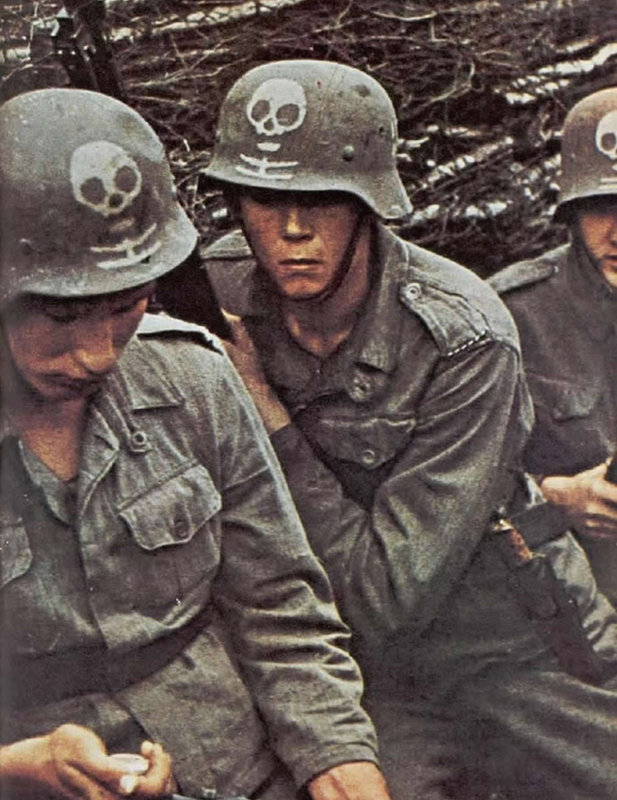 The reference that Thomson's seem to have supplied Jose Bielsa looks as if it was sourced from a photograph of Finnish troops who fought against their traditional enemy the Russians as part of the Nazi's allies. The photograph in question shows a group of Finnish troops in 1945 wearing remarkably shoddy looking tunics and German 1942 pattern Stahlhelms (apart from the man on the far right wearing a 1916 pattern helmet) decorated with the somewhat outre Finnish devised skulls used by Bielsa. 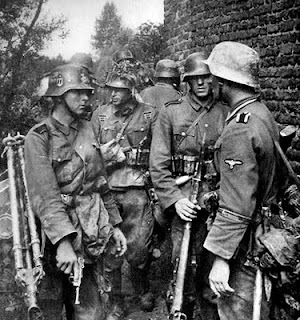 Barr's cover is a tad more convincing in regard to the uniforms but still way of the mark compared to a photograph of the kind of SS troops that British troops would have encountered as the following photograph depicts. But don't let this deter you from casting a vote for Commando No. 25 - or any other Commando that takes your fancy for that matter. It's all part of the fun of this remarkable comics fiftieth birthday celebrations. All artwork © DC Thomson 2011. Wow! 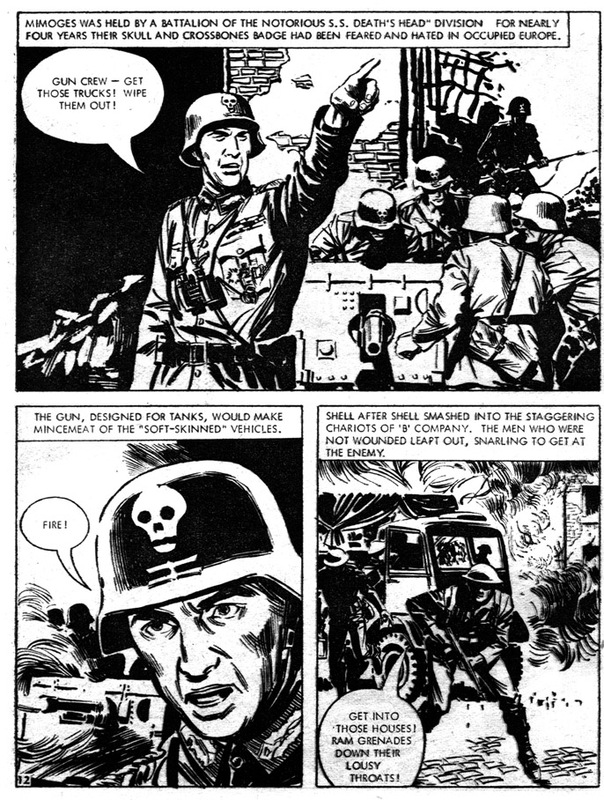 DC Thomson ought to hire you as the official Historical Advisor for their Commando comics Peter - your knowledge of WW2 is truly remarkable! Oddly enough I just bought the box-set of Thames Television's old 'World at War' series which, at just £20 for over 30 hours of material is an amazing bargain. I know some of the production values may seem a little old-fashioned today, but for anyone interested in the period it really is indispensable - especially as it was made when many participants were still alive and able to record their personal testimony for posterity. In addition to which some of the episodes are extremely well written. However, above all the thing that makes the series stand out for me is the fact that I can still remember watching it with my late father who used to add fascinating pieces of first-hand knowledge about so many of the events portrayed. Fascinating Phil, I remember you mentioning your father's war time experiences in an earlier posting and having just revisited a Channel 4 documentary on the battle for Monte Cassino I do recall that you mentioned his involvement in the dreadful campaign. As a matter of interest which version of the World at War did you plump for? 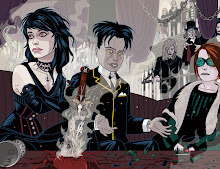 The new version which has been digitally tarted up and sound efx'd has garnered a lot of negative feedback, especially as a result of the cropping that occurred when Freemantle decided to make the series widescreen TV compliant. The old format DVD series is now fetching insane prices on Amazon. Unfortunately it's the new one - misleadingly called the "Ultimate Restored Edition". :-/ Fortunately I've still got the whole series on VHS as well, though I was hoping to get rid of that as it takes up so much space. There was a set of World at War DVDs which was given away with the Daily Mail and those might be worth checking out Phil, but on the pro side of the new release I gather that the sound is in stereo. 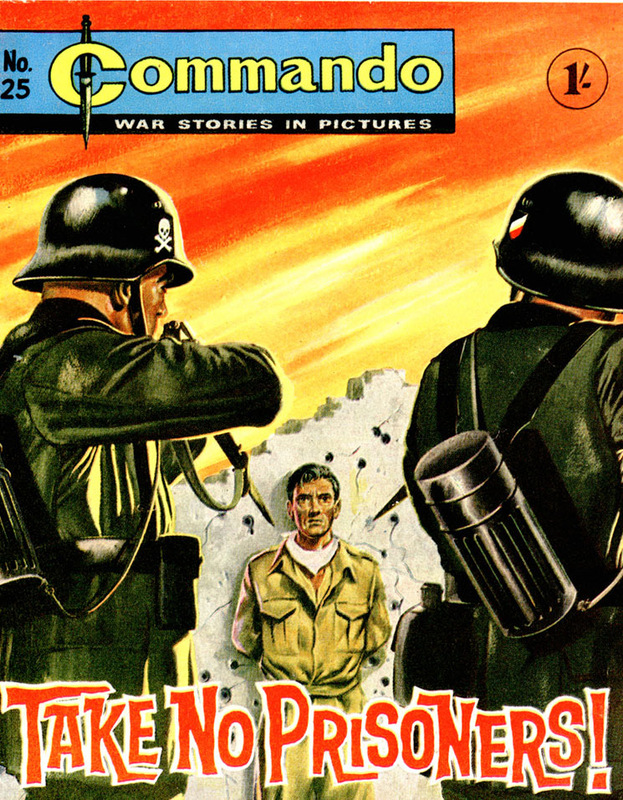 Next edition of the World at War and the picture will be probably be in stereo as well. Hey this site is really nice, i njoyed reading it..